The media wings of different regions which made up Biafra nation took it as a point of duty to gather and enlighten our media gurus on what is at stack. The Biafra struggle as it is today has taken a different dimension in the bid to continue propagating the gospel of Biafra to the ends of the earth; we must brace up to fit into the current media struggle to freedom. The struggle has changed her temple and the media war has just begun. 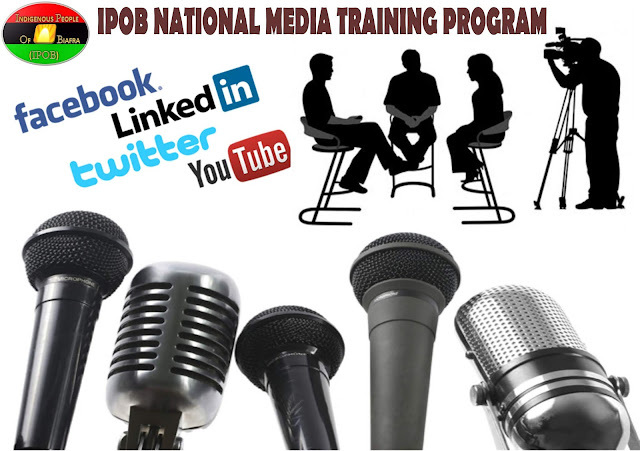 The IPOB national media training has vowed to change her strategy to counter the brown envelope journalist in Nigeria. We educated ourselves on what media is all about and the role of media in the Biafran struggle. The Indigenous People Of Biafra (IPOB) led by Mazi Nnamdi Kanu has been up doing regarding the media. And they are not relenting until the indigenous people collapse this entity known as Nigeria today. We are winning the war at all fronts and the Nigerians state are helpless because of the IPOB media gurus fighting tooth and knees to make sure we stand tall to call a spade a spade. Remember truth and honesty is our watchword. We don’t intend to retreat nor surrender until we achieve our goal. However, lots were discussed regarding our diplomatic move to making sure the flag of Biafra was raised and the task ahead of us. The IPOB first national media training was hosted in Rivers State Biafraland on the 25th November 2018; it was a prodigious one having great thinkers in our mist. However. Bayelsa states Media were present, and Aba, Rivers, Lagos, etc. were all present in the training. It was indeed a powerful one and I can beat my chest and say that about 30 media gurus who were present learnt a lot that very day. Digesting what media is all about. It is one of the most powerful tools of communication in the developing countries, as well as in the developed countries. It can aid in promoting the right things at a right point of time, or can make use of any situation to create disturbance around the people or in the society. Media helps to provide a strong message to the world about what is right or wrong. Media are the collective communication outlets or tools used to store and deliver information or data. It is either associated with communication Journalism the specialized mass media communication businesses such as print media and the press, photography, advertising, cinema, broadcasting (radio and television), publishing and point of sale. Media is present all around us. For example, when we watch the Television; listen to the radio; read books, newspapers, magazines, journals; etc. The world is making a steady progress towards a better future every day. But still, people are bound by the social problems and issues directly or indirectly are “affected by the people, of the people and for the people.” Media Keeps You Informed Irrespective Of Geo-Location. No one can deny the blessings of media in today’s world. The mass media helps people to remain informed and updated about the various news, events, social activities, lifestyle, entertainment, and advertisements irrespective of the geographical barriers. Media can help to create awareness among the people faster than any other thing. In fact, mass media can have a great impact on peoples’ lifestyles and culture. For example, girls living in a conservative country or girls who are growing up in a conservative culture can be prompted and motivated to wear short dresses by watching TV shows or by following another country’s culture. They might consider by wearing short dresses they can become cool just like the TV personalities they admire. While the above point stresses on the negative impact of TV, it also has made some positive impact for the society. Through television, one can create social awareness about many social and economic issues like AIDS, Child Abuse, Female Feticide, Fulani Herdsmen killings, Boycotting of Elections, and so on which are for example, television channels organize TV shows like “Voice of the People (VOP)” which focuses on making people aware of the harsh realities of life. It mainly discusses and provides possible solutions relating to the various social issues in Biafra land. It aims to empower citizens with information’s. Hence, through this type of shows, many NGOs comes up with the social causes and holds campaigns, demonstration, and protests in order to demand justice. However, we held the privilege to have the Media head of IPOB (Worldwide) Mazi Chukwudi Ofomah who spoke to us via Facebook messenger from Australia, he acknowledged our media efforts in bring the contraption to zero and leading the media war. He appreciated our efforts and promised to host all the media gurus in Biafraland for a one-week enjoyment when the kingdom of Biafra is finally restored. We have something the republic of Nigeria doesn’t have which is Chukwu Okike Abiama (the supreme creator of the universe) and nothing they could do about it he said. The Nigerian state has tried to stop us with all the billions they heard but they couldn't. They even went very far to bribe some of us to betray and dance to their tune and which they got some cheap ones among us who fell by the roadside but Chukwu Okike Abiama is always piloting the struggle and keeping us going. As the holy book has it "Many Are Called but Few Are Chosen". Many are called to the struggle but few are chosen to continue pushing forward until we achieve our goal which is Biafra restoration. He urges every media outlet to stand firm with honour to restore motherland. Make sure you are among those that made Biafra a reality. Am sorry to say this, everybody destiny is different, there are those that sacrifice their lives for others to live, whatever your destiny is, make sure you accomplish it, so that we will leave a legacy and our name will be written. There are sets of people on this earth, there are those that make things happen, and those that follow those that make things happen. I do believe we are among those that make things happen he said. He concludes, we should continue to write and also improve in our writing. He spoke for about 8 minutes or thereabouts and urge us to stay away from different bloggers who use Biafra struggle to lie with their fake news and to draw traffic to the websites. He quoted and said there is lots of fake’s news making waves on the internet and urge us not participate on spreading such news on our platforms. We must verify the authenticity of the news we share before spreading it he said. If the news does not come from IPOB officers or our websites, we shouldn't share them he urges all the IPOB media warriors to always remain resolute and steadfast because Biafra freedom is at hand he concludes. We also have the honour and privilege to have Lolo Oby Mboma who was appointed by Mazi Chukwudi Ofomah to organize and held the state media in Biafraland and making sure the unity we once enjoyed is restored back. Lolo Oby Mboma who called from London and has been the source of our inspiration to making sure state media goes smoothly without any interference. She is the major organizers of the national media training in Igweocha. She has been working effortlessly from the scene to making sure different state Medias are up doing to restore motherland. Indeed, she is a lioness and those that make things happen as long as state media is concerned. Indeed, it was a great honour to have her and we are pretty grateful for her kindness and upkeep for making the training a reality. She thanked the Media Head of IPOB worldwide, Mazi Chukwudi Ofomah for aiding and contributing in the program and also advised us to venture into research and make it hint the world standard. She spoke for about 28 minutes and urges all the media outlets to be up doing until we achieve our goal which is the Biafra restoration project. We can't fail to thank Mazi Chika Austin who came all the way from Imo Province of Biafraland down to Port Harcourt (Rivers State) which was the host; and also lectured us extensively on what social media is all about and the role it has played in the Biafran struggle. All thanks to Rivers State Media (Port Harcourt) headed by Mazi Chibueze Uchemchukwu for making it a success. Mazi Iwuala Chibueze, Mazi Chukwudi Ofomah, Lolo Oby Mboma, Mazi Chika Austin, Mazi Chibueze Uchemchukwu, Mazi Blessedson Johnny, Mazi Kingsley Uchenna, Mazi Dimkpa Ikenna Ikenga Amadioha-Gbo, for their contribution to the training. We shall restore Biafra under IPOB leadership led by Mazi Nnamdi Kanu the Director of Radio Biafra / Biafra TV. Biafra freedom remains sacrosanct and inevitable. All hail Biafra the children of the light.